don't get caught: Artisanal social media: Can we tell there are real people doing your postings? Artisanal social media: Can we tell there are real people doing your postings? Quick, tell me: What time of year was your Facebook page avatar photo taken? What time of year is it now? 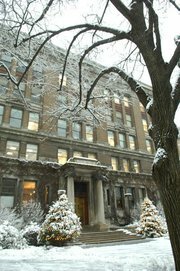 I follow client Rockefeller University and was charmed to see the photo at left pop up as its new Facebook avatar recently--in the wake of all that New York City snow. It's a small thing, sure, and not precisely real-time. But it makes the page feel that way, and gives me a sense of the place, right now, in need of shoveling and shivering. Can I say the same about your page? I've been listening to other clients and friends lately who describe moving toward (or just staying in) that kind of artisanal approach to social media. They're aiming for authentic, whether in their organization's postings, their own postings or what they're consuming on social media. It's a more transparent, real-time approach--one that lets us see there's a human in there. And now, a major observer of the PR field is decrying the opposite tack, the uber-automated faux presence on social media. Another colleague told me his preference these days is to follow people, not brands. That is, if you're someone posting as yourself, even if you represent a brand, he'll follow you--but not a branded account. The reason? "The content is bland and uninteresting--too many brands don't really use their feeds well." Can't argue with that. My approach is to follow a wide variety of brands and people, but I can tell you I tire quickly of the auto-posted, repetitive, relentless selling of some brands. Some of the best moments on Twitter and Facebook have not been pre-loaded, but come from quick-on-the-draw and deft, funny handling of odd situations. Still another colleague who's been posting under a handle that's branded with his organization's name switched and began tweeting under his own name--something I recommend especially when your only social media presence "belongs" to your employer. My concept of the networked communicator includes thinking through your own branding, because employers are fickle, and social media is your friend. Shel Holtz weighed in on the extreme version of automated social media in a post called The PR industry must condemn massive automated sock puppetry. He rightly goes after those using "persona management" tools to make small groups look like massive movements. It's a chilling read. No wonder my pals are pulling back from following brands. Social media seems daunting to the communicator who sees it as a sea of nails needing a hammer, and some reach for the automated version. Some look for the traditional amount of control, avoiding the concept that traditional levels of control have left the building, thanks to technology and the public's embrace of that freedom of information and information tools. Just remember that works both ways: Your relentless feed may push opt-outs, rather than follows. The fact that you can automate it doesn't mean you should, unless you can make a strategic case for it--and note the exceptions and how you'll handle them.